MEASURING a player’s worth to a club shouldn’t always be confined to his entire career; sometimes it can come back to one brilliant season, and a few memorable moments. Take Matty Ryan, Collingwood’s plucky rover of the mid-to-late 1980s. His five seasons at Victoria Park yielded 45 games – the same tally as the number he wore on his back – but he is best remembered for what occurred in one of them (1987). What the young Magpie achieved in that season is what few Collingwood players have managed to do across their careers. He was runner-up in a Copeland Trophy, to no lesser player than Darren Millane. He was second to Brian Taylor as the club’s most prolific goalkicker, was Collingwood’s highest disposal winner (478) for the season and was even the Magpies’ best vote-getter in the 1987 Brownlow Medal (nine). Making all that even more remarkable was the fact he was only 20 when he did it. Incredibly, he would only play 20 more games for the club across the next two seasons and never managed to recapture that 1987 form for a variety of reasons – not the least of which was a difference of opinion with coach Leigh Matthews. Ryan had grown up as a Collingwood supporter and was recruited via the club’s junior pathway from Eltham – the same club that had produced a very different looking Magpie Peter Moore a decade earlier. What Ryan did in his first two senior seasons – three games in 1985 and two the following year – gave little indication of what was to come. That all changed in 1987, and as much as the Magpies struggled that season, Ryan flourished as one of the most improved footballers in the newly-expanded competition. The blond-haired rover stood at 175cm and was barely 73kgs wringing wet, but he more than made up for any perceived frailty with a passion for the contest. His attack on the ball wasn’t always good for his physical well-being, yet it never seemed to stop him. The perfect example came in Round 4 when he played an important role in one of the best comebacks in the club’s history. At the 23-minute-mark of the third quarter, the Magpies trailed by 51 points. By game’s end, Collingwood had won by 10 points, with Ryan contributing two goals in the victory. Not that he could remember all that much about it. In the dying stages of the match, he and Paul Morwood launched a desperate tackle on Richmond’s forward Michael Mitchell. As the three players grappled, Ryan crashed to the turf, and he was taken from the field, bleeding from the mouth, concussed and with an injured sternum. He finished the year in the same vein of form as he started it, having 30 disposals and kicking three goals in the win over Essendon – a performance Matthews described as his best. Ryan took home two trophies from Copeland night – he was second best-and-fairest to Millane and, not surprisingly, was Collingwood’s most improved player of 1987. Such was Ryan’s form in 1987 that he was selected in a tentative squad of 37 players for the Bicentennial Carnival before the start of the next season. While he didn’t get to play, it showed others outside Collingwood were starting to take notice of him. Yet from the moment the 1988 season started, he couldn’t replicate that same impact and influence he had shown the year before. He was concussed in a clash with Hawk Gary Ayres in a pre-season game, and further head knocks would ultimately see Ryan use a helmet at times later in his career. While he still played 18 games in 1988 – only two less than the previous year – he had almost 200 fewer possessions and spent stretches on the interchange bench, often used as a burst player rather than a starting rover. 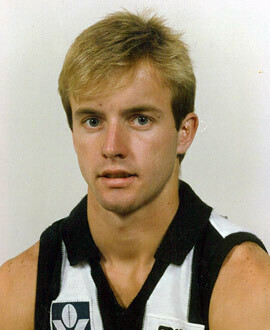 Only two more games came in 1989, and his last game for Collingwood came against Carlton in Round 15, 1989. He wouldn’t be back – not at Collingwood, at least. Sydney chased Ryan the hardest, and he was traded for the Swans’ second and sixth national draft selections. He didn’t have to wait long to play his former side, returning to Victoria Park for his first game with the Swans. He played superbly, having 26 touches and kicking three goals in the loss. But his time with Sydney was short-lived – 10 games in one season – and he ultimately finished his AFL career with Brisbane, where he played 18 games in 1991-92. Fittingly, the last of his 73 career games was against Collingwood, early in the 1992 season. Then, just as he had with the Magpies three years earlier, he quit league football. The good news was Ryan wasn’t lost to the club he had barracked for as a kid. He has been a regular at past players’ functions and even played in a few ‘legends’ matches over the years – with his locks long gone, but still lightly framed and just as eager for the ball as ever.